Hi friends. Today I would like to share with some information regarding a herb called Safflower flowers. To be frank, I have not hear this name before. I hope this information will be useful to everyone. 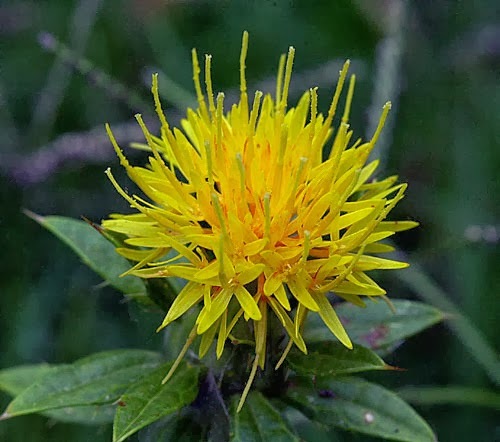 Safflower is an annual herb whose botanical name is Carthamus tinctorius. It has long, spiny leaves and yellow or reddish flowers on a stiff, upright stem. The seeds produce an edible oil. Height is about 3 ft. It Is said to have a warm nature and a pungent taste. 1. It can be used to treat measles, fever and skin rashes. 2. Safflower oil has the ability to lower serum cholesterol levels, thus useful in preventing heart disease. 3. Identified as the source of several flavonoids. One of the flavonoids is Quercetin, which is a well-known antioxidant.